Capacity: Small: 0.5 oz. ; Medium: 2.94 oz. Weight: Small: 0.01 lb. ; Medium: 0.04 lb. Good size for a pill case. 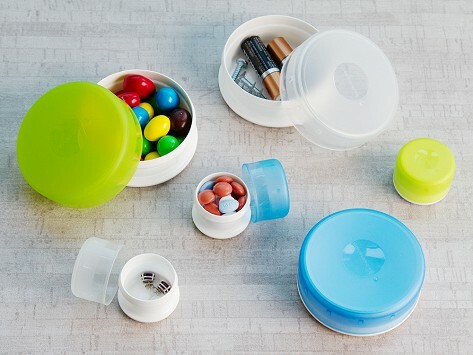 I use these for pill boxes. They are easy to open one handed and easily fit in my purse or pocket. The medium-size GoTubbs are great for storing change, etc. I like that you can open these with one hand.